:: More from Alberta and also the Northwest Territories, north of Alberta’s tar sands — a new report from nine Canadian, American, and Scottish scientists convened by the California-based Rosenberg International Forum on Water Policy says the area’s 30,000 acres of tailings ponds pose a serious threat to the Mackenzie River basin (three times the size of France) in the event of a breach, posing a risk to wildlife, including the world’s only wild Whooping Cranes, which breed in nearby Wood Buffalo National Park. :: The Dorset (UK) Wildlife Trust wants visitors to its 42 reserves to stop using birdsong apps for pishing, because it’s disturbing nesting birds and their young. :: Cats vs. birds — or cat lovers vs. bird lovers — in an article from New York Magazine by Jessica Pressler on the fall-out following publication of the recent paper, “The Impact of Free-Ranging Domestic Cats on Wildlife of the United States”. 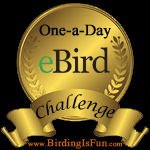 This entry was posted in Alberta Animals, Alberta Birds, Articles, Bird Conservation, Birding, Birding News, Blogging, Canada Birds, General Birding, Nature, Nests and eggs, Spring Migration, Wildlife. Bookmark the permalink.